These general terms and conditions apply to the supply, unless otherwise agreed in the contract. The supply encompasses equipment in accordance with the specification referred to in the contract, even if minor parts within the framework of the supply and that naturally belong to the supply, are not expressly stated in the specification or are evident from the associated drawings. Unless otherwise agreed, the price is fixed and it includes all customs duties, taxes and other fees. In the event of amendments to customs, taxation or duty regulations that form a basis for the contract price, the price shall be amended correspondingly. For advance and future payments, payment shall be made in cash within 14 calendar days after the instalment (payment dates) that are determined in the contract. Invoices (including the final invoice) are due for payment on completion of the supply. Invoices are due for payment/payment must be made within 30 calendar days. Late payments will incur interest in accordance with legislation pertaining to Interest on Arrears. The equipment (materials) will become the Purchaser’s property on handover. Lien can be agreed in the sold equipment (security) for any claims on the purchase sum, with the addition of interest and charges. The following circumstances shall be considered to be force majeure, if they occur after the contract has been signed and prevent the fulfilment of the contract: War, riot or civil unrest, policies introduced by public authorities, natural disasters, failure in the public power supply or in normal communications, significant labour disputes, fire or other circumstance of a similar nature and radical significance. The Supplier has the right to demand that the supply time determined in the contract shall be extended, corresponding to the time period that the work has been delayed, in the event of force majeure, within his own company or that of his subcontractors. The Supplier must, immediately after a delay as stated above has occurred, or as soon as he is aware that a delay will occur, give a written notification and provide all necessary information. The Supplier has the right to demand that the supply time that has been determined shall be extended, corresponding to the time period that he has been delayed in performing work due to any delay in receiving the correct information from the Purchaser, necessary for supply of the equipment. The Supplier shall immediately provide the Purchaser with a written notification regarding all delays and increases in costs that he has reason to believe will occur. The Purchaser, if there is a delay in the delivery of equipment due to reasons brought about by the Supplier (not force majeure), has the right to impose a default penalty. The default penalty will be set at 1 - one – thousandth part per business day after the agreed supply time, calculated based on the agreed contract sum, which is associated with the part of the supply that due to the delay cannot be taken into use as intended. The default penalty is limited to 10% of the stated part’s value. The Supplier’s total compensation liability for the delay, inclusive paid default penalty, cannot exceed 15% of the contract sum. The Supplier holds the risk for all equipment (material) until handover/supply. The Supplier holds the responsibility for damage to property belonging to the Purchaser that is caused by negligence by the Supplier or another party he is responsible for as part of the supply. Under the same terms and conditions, the Supplier is liable in relation to the Purchaser for personal injuries. The Supplier, in performing the supply, must be covered by insurance for liability for damage/injury to a third party’s (including the Purchaser’s) property and to persons, including product liability, for a liability that shall be no less than NOK 1 million per incidence of damage/injury. The Supplier’s liability is limited to the insurance policy’s value. The Purchaser is obliged to examine the material on receipt. The Purchaser must notify the Supplier in writing if any defects or faults are discovered, including transport damage, at the latest 7 (seven) days after receipt. If the Purchaser fails to do so, he will lose the right to claim defects that could or ought to have been discovered on investigation when the material was received by the Purchaser. A defect is not said to exist if the material is supplied in accordance with general industry standards, applicable legislation and regulations. Further, the Supplier is not liable for faults and defects that are caused by assembly or installation not being performed in accordance with applicable standards and instructions. The Supplier is liable for ensuring that the supply is carried out to a professional standard and in accordance with the contract specifications. The Supplier is obliged to rectify all faults that are caused by defects in construction, materials or manufacture, in accordance with the determined specifications. 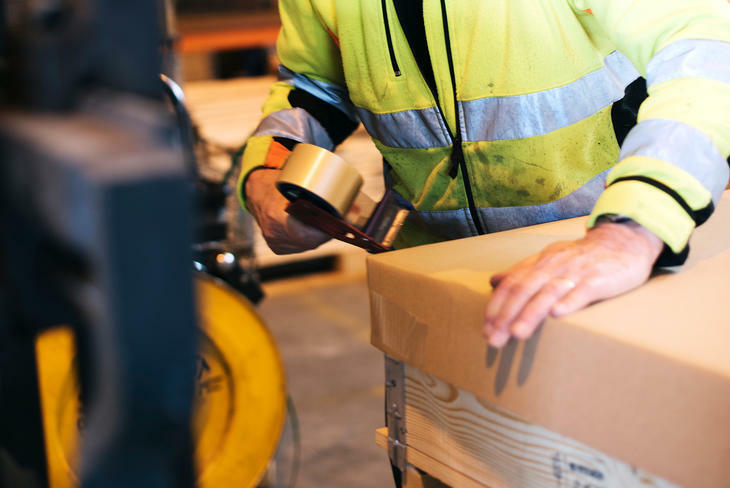 The Supplier’s liability encompasses defects that become evident during a period of 18 month’s normal operations; however, not beyond 24 months after delivery. The Supplier, at his own expense and at no cost to the Purchaser, shall replace or repair the defect parts that are necessary to bring the contract object to a level of quality and to contractually agreed condition. For replaced parts, the same limitations apply as in the paragraph above. If the object cannot be brought into a contractually agreed standard by replacement within a reasonable time, the Purchaser has the right to cancel the purchase, relating to the part of the supply that cannot be used as intended as a result of the Supplier’s omission. The Purchaser, in such case, can claim compensation for losses, limited upwards to 15% of the purchase sum for the cancelled part of the supply. The Supplier does not have any liability for damage to property and chattels that occurs whilst the supply is in the Purchaser’s possession. The Supplier does not hold any liability for damage to the product manufactured by the Purchaser, or to products that these are a part of. If rectification of faults/defects on the supplied material will require disproportionate amounts of work or will lead to expense that exceeds the contract value of the faults/defective material, the customer cannot demand that repair is carried out, or the expense of such repair compensated. The Supplier, regardless or any other regulation, shall not be liable for indirect losses incurred as stated in the Sale of Goods Act § 67, section 2, losses stated in the Sale of Goods Act § 67, section 3, nor any other consequential losses such as costs for works, daily penalties, damage/injury compensation, lease losses or losses of income, goodwill, assignments or opportunities incurred by the customer, regardless of cause and regardless of how these have occurred. These limitations on the Supplier’s liabilities do not apply if the Supplier has been found to have been grossly negligent. Note that all of fasteners (screws, nuts, washers etc.) are counted by counting weight, according to given procedure, from our subcontractor. None conformance in numbers under plus / minus 3 % will therefore not be accepted. The vendor can re-purchase up to a maximum of 20% of the amount of goods for a maximum 80% of the sales price for the particular type of goods. 1. The goods are of the goods category type = A which means that the articles are in stock. 2. The goods are of good quality and are saleable without further cleaning or other form of processing (goods volumes that the Purchaser wishes to resell to the seller beyond 20% of each goods type must be agreed in each case, and the seller is free to refrain from re-purchasing the goods). 3. The Purchaser is responsible for returning the goods back to the seller, to the seller’s sales location, in accordance with the supply terms and conditions DDP Incoterms 2010 (at no cost to the seller).